There are several ways people can have two different colored eyes. People can be born with heterochromia, or it can result from disease or injury. It’s pretty rare for people to inherit mismatched eyes from their parents. But before diving into the details, we need to understand where eye color comes from. Your eyes are made up of a lot of different parts. The “whites” of the eyes are called the sclera. The dark center is called the pupil. And the colored part in between is the iris. But what gives the iris its color? The color comes from a pigment called melanin. This is a brown pigment that causes dark hair, skin, and eyes! The more melanin that is present in the eye’s irises, the darker the eyes will be. Brown eyes have lots of melanin and blue eyes have very little melanin. 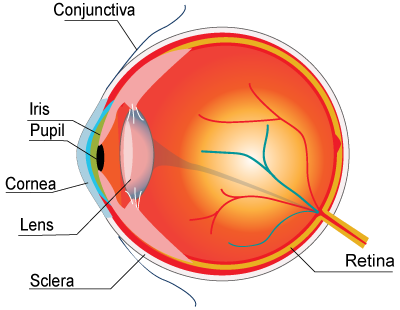 The iris surrounds the pupil. In the case of heterochromia, each iris has a different amount of melanin. But how can this happen? Melanin is made is special cells in the body, called melanocytes. If something goes wrong with the melanocytes in one eye, they might not make as much pigment. This can lead to two entirely different colored eyes! But what can go wrong with these pigment cells? How can someone end up with one eye that can make pigment, while the other eye can’t? Heterochromia rarely runs in families. Instead, it is often caused by slight damage to the eyes. If this happens during pregnancy or just after birth, someone can be born with mismatched eyes! But how does this happen? Why is eye color so sensitive to mild injuries or minor diseases? It all comes back to those pigment-producing cells. It turns out these melanocytes aren’t made in the eyes. Instead, they have to travel there. If the pigment cells get damaged, they might not make it to the eyes at all! Or maybe they’ll make it to one eye, but not the other. If one eye ends up with less melanocytes, it won’t be able to make as much pigment and will look lighter. Other times, heterochromia at birth is caused by a larger condition or syndrome. There are several different disorders that can cause heterochromia, including Waardenburg syndrome, Sturge-Weber syndrome, Horner's syndrome, or Parry-Romberg syndrome. All of these are rare and have other symptoms in addition to heterochromia. In the case of Waardenburg syndrome, mutations in certain genes can result in pigmentation defects. These mutations prevent the developing melanocytes from going to the correct place. If the melanocytes don’t complete their journey the eyes, they won’t get the correct amount of pigment. This can result in either heterochromia or two very pale, blue eyes. Waardenburg syndrome can be inherited. If one parent has it, there is a high chance the child will have it as well. And you’d probably know if you have Waardenburg, since it doesn’t just affect eye color. Most affected people have varying degrees of hearing loss as well. And finally, there is one other (rare) way a baby can be born with heterochromia. And this one isn’t caused by injury, disease, or mutation! Two different color eyes can sometimes happen in chimeras. It’s rare for people to have heterochromia written in their DNA. Aside from the genetic syndromes mentioned above, heterochromia is usually caused by random chance. But this is not true for all animals. Huskies, Australian Shepherds and Border Collies often inherit heterochromia from their parents. For dogs, having mismatched eyes is genetic! An Australian Shepherd mix with heterochromia. Unlike in humans, many dogs have genetic heterochromia. Changes in eye color can also occur after birth. This usually is a result of injury or disease. People with glaucoma sometimes end up with mismatched eyes. This disease is often treated by eye drops that can stimulate the production of melanin in the iris. This extra pigment can cause your eyes to get darker! Tumors can also change your eye color. They can appear as light or dark patches, giving the appearance of two different colors. Eye injury or trauma can also damage your melanocytes. If the melanocytes die, they’ll stop making pigment and your eyes will get lighter. But heterochromia isn’t the only way that two eyes can appear to be different colors. Take the late rock-star David Bowie, for example, who had anisocoria. Bowie got into a fight where one of his eyes got scratched. This permanently damaged the muscles that cause the pupil to contract, leaving it permanently dilated. That eye looked darker than the other, even though both were blue! Having two different sized pupils is called anisocoria. These are just a few of the ways people can end up with mismatched eyes. Eye surgery, swelling of the eye, and even diabetes have all been linked to heterochromia. So in general, heterochromia usually occurs because something went wrong with the pigment-producing cells in our eyes. While it can be genetic, it is most often caused by injury or disease. What are the genetics of heterochromia? What are the genetics of sectoral heterochromia? Gladstone, R. “Development and Significance of Heterochromia of the Iris” Jama Neurology. “Waardenburg Syndrome - Genetics Home Reference - NIH.” U.S. National Library of Medicine, National Institutes of Health, Aug. 2016.